Five seat convertibles are particularly rare. This is due to the peculiarities of convertible car chassis and body design. 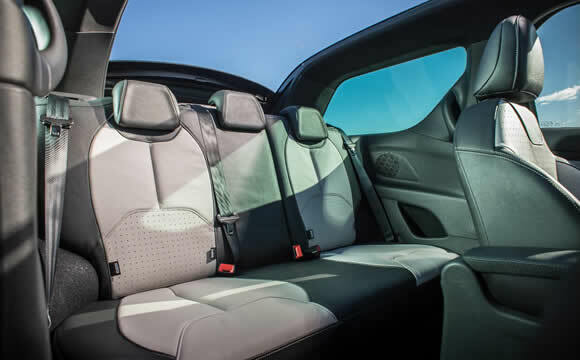 The rear seating passenger area of a convertible is firstly often narrowed by the thicker side walls which will enclose the roof when it is folded. This alone makes many convertibles unsuitable to seat five. There is also the issue of chassis design. In order to provide a chassis stiff enough to give an acceptable drive when a roof is removed from a previously hardtop five seat car, engineers must make considerable modifications. These changes usually include reinforcement to the sills – the structural box sections on either side of the car below the doors. In addition, a central beam may run down between the seats. This will give the floor a W cross-section and remove any leg room for a centrally seated passenger. 5 seater convertibles are therefore limited to conversions from hardtop cars produced by independent coachbuilders and cars such as the Jeep Wrangler Unlimited which have a separate chassis rather than the more modern monocoque design. The Jeep is one convertible that will seat five in comfort but is not really suitable for everyone. The Citroën DS3 Cabriolet has been updated with slick new lights and a pair of energy efficient diesel engines. When we reviewed the Citroën DS3 Cabriolet last year we found it an a fun and thoroughly modern car. The DS3 sees Citroën back at their best, designing cars that are unlike anything else on the road and full of innovation. The design is thoroughly modern and a refreshing change form the retro styling used on many small convertibles.